Oriental lily Casa Blanca has the most exquisite large, pure white flowers and my house has been filled with the most delicious scent. There are four flowers, dripping with nectar on a strong straight stem. I purchased this bulb, along with several others, from Hyde Nurseries at BBC Gardener’s World Live in June this year and planted them in pots straight away. They have been happily growing in the greenhouse all summer and I brought them into the house in turn when they started flowering. This one is the favourite of the varieties I bought this year. 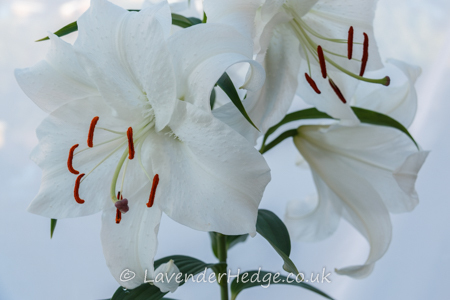 Lilies can be grown in the garden, just remember to plant them at least 6 inches deep. Remove faded flowers, but allow leaves to remain as this will give strength back to the bulb for next year.